(Nanowerk News) The Materials Project, a Google-like database of material properties aimed at accelerating innovation, has released an enormous trove of data to the public, giving scientists working on fuel cells, photovoltaics, thermoelectrics, and a host of other advanced materials a powerful tool to explore new research avenues. But it has become a particularly important resource for researchers working on batteries. Co-founded and directed by Lawrence Berkeley National Laboratory (Berkeley Lab) scientist Kristin Persson, the Materials Project uses supercomputers to calculate the properties of materials based on first-principles quantum-mechanical frameworks. It was launched in 2011 by the U.S. Department of Energy's (DOE) Office of Science. In 2012, DOE established the Joint Center for Energy Storage Resarch (JCESR), a DOE Energy Innovation Hub, which significantly enhanced the Materials Project with new simulations of next-generation battery electrodes and liquid organic electrolytes. "This massive amount of precise data released through the Materials Project will have a profound and lasting impact on the battery research community," said JCESR Director George Crabtree. "This is a great example of the way Berkeley Lab and other JCESR partners share scientific knowledge to advance the scientific frontier." The Materials Project’s Battery Explorer app now allows researchers to work with other ions in addition to lithium. The sheer volume and scope of the data is unprecedented, said Persson, who is also a professor in UC Berkeley's Department of Materials Science and Engineering. "As far as the multivalent cathodes, there's nothing similar in the world that exists," she said. "To give you an idea, experimentalists are usually able to focus on one of these materials at a time. Using calculations, we've added data on 1,500 different compositions." While other research groups have made their data publicly available, what makes the Materials Project so useful are the online tools to search all that data. 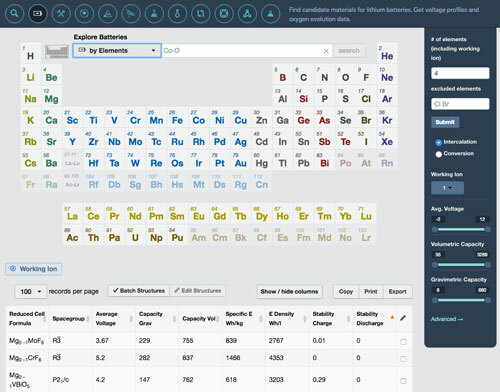 The recent release includes two new web apps--the Molecules Explorer and the Redox Flow Battery Dashboard--plus an add-on to the Battery Explorer web app enabling researchers to work with other ions in addition to lithium. "Not only do we give the data freely, we also give algorithms and software to interpret or search over the data," Persson said. "For multivalent batteries it's so hard to get good experimental data," Persson said. "The calculations provide rich and robust benchmarks to assess whether the experiments are actually measuring a valid intercalation process or a side reaction, which is particularly difficult for multivalent energy technology because there are so many problems with testing these batteries." "These materials may not work well the first time you make them," Persson said. "You have to be persistent; for example you may have to make the material very phase pure or smaller than a particular particle size and you have to test them under very controlled conditions. There are people who have actually tried this material before and discarded it because they thought it didn't work particularly well. The power of the computations and the design metrics we have uncovered with their help is that it gives us the confidence to keep trying." The researchers were able to double the energy capacity of what had previously been achieved for this kind of multivalent battery. The study has been published in the journal Energy & Environmental Science in an article titled, "A High Capacity Thiospinel Cathode for Mg Batteries." "The new multivalent battery works really well," Persson said. "It's a significant advance and an excellent proof-of-concept for computational predictions as a valuable new tool for battery research." "The Materials Project has enabled some of the most exciting research in my group," Morgan said. "By providing easy access to a huge database, as well as tools to process that data for thermodynamic predictions, the Materials Project has enabled my group to rapidly take on materials design projects that would have been prohibitive just a few years ago." "This is the way to reach a significant part of the research community, to reach students while they're still learning material science," she said. "It's a teaching tool. It's a science tool. It's unprecedented."